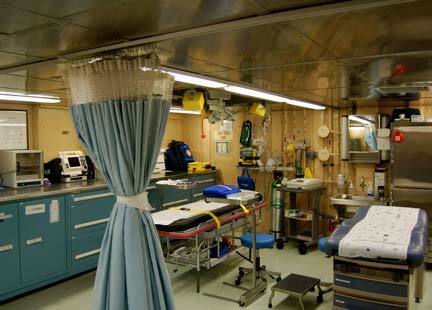 The Sick Bay (medical clinic) on the Healy is the largest and best equipped in the Coast Guard. It has to be, since we are so far from land for such long periods of time. We have a digital x-ray unit and a cardiac unit for diagnosis, defibrillation, and pacing an irregular heartbeat plus everything needed to keep a patient stabilized and pain free until they can get to a hospital. 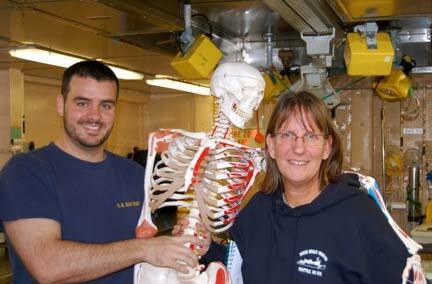 The Healy is also the only cutter with a permanent Physician’s Assistant (PA) on staff. The most serious medical issues our current PA has had to deal with on the Healy are broken bones and deep gashes. If a patient did have a life threatening injury, they would be kept comfortable until an aircraft could get them to shore. I spoke with Lt. Jason Appleberry (Physician’s Assistant) and HS2 (Health Services Technician) John Wendelschaefer who staff this important part of the ship and asked them about their jobs and their training for working in healthcare on an icebreaker. The busiest times in Sick Bay are when new people come on board with new germs. When the crew has time on shore or new crew or science parties join the Healy – colds and other minor inconveniences crop up. The Coast Guard has strict rules about vaccinations for anyone spending time at sea and a very visible strategy to help prevent the spread of germs. There are hand sanitizer dispensers in the mess (cafeteria) and elsewhere. Anti-bacterial wipes are available in the gym to wipe down sweaty equipment. The medical staff inspects the cooks and the galley like a Health Inspector would at a restaurant. Sick Bay also has an incubator used to test the drinking water for contamination. And last but not least, every Saturday, everyone cleans! Heads (bathrooms), staterooms (bedrooms), and the rest of the ship are disinfected and made ready for inspection. So kids, you have to make your bed and clean your room – even on an icebreaker!! I asked Lt. Appleberry how he ended up in this job. As a young man his career interests included, doctor, paramedic, firefighter and other jobs that combined adventure with a curiosity about science and medicine. In his words, he wanted to be – “that guy who shows up during a disaster to help.” After a few years of college he spoke to the Coast Guard and thought Coast Guard search and rescue would offer adventure and medicine all in one career. He enlisted in 1991, and since then has traveled all over the country learning and serving. Lt. Appleberry earned a Masters degree through the Coast Guard and has been able to use his training in clinics in Kodiak, Alaska and Hawaii and on various ships. FOR MY STUDENTS: Have you thought about what kind of career you would like to have? What do you enjoy doing? What activities drain you? What activities invigorate you? Part of the mission of the Coast Guard is search and rescue. If someone is hurt on a fishing boat or a pleasure boat is lost at sea, the Coast Guard is there to help. HS2 (kind of like an EMT for civilians) Wendelschaefer has also received his medical training through the Coast Guard. His experience has been that the Coast Guard is a great place to be a lifelong learner. There are lots of choices for career paths, tuition assistance, and constant on the job training. For both men, the Coast Guard has been a positive experience. They have traveled to and lived in exotic locations, and should they decide to leave the military – they have very marketable skills for the civilian world. 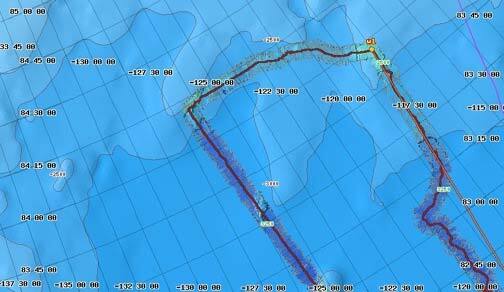 This is a screen shot of our path as we hit our northern most point. The red line indicates the 840 parallel. Today we hit our northern most point of the trip. We were north of 840 and as they say, it’s all down hill from here! This is the closest I will ever get to the North Pole. Next week we will have a ceremony for all the folks on the ship who have crossed the Arctic Circle for the first time. This summer I crossed the Tropic of Cancer (look that one up) when I went to Baja, Mexico and the Arctic Circle. It was easy for me because I had air transportation. Some animals make migrations like this every year!!! The gray whale will swim from the Tropic of Cancer to the Chukchi Sea every year without the benefit of an airplane – AMAZING! FOR MY STUDENTS: Look at a map. Follow 840 North and see where it goes. Think of all the places you have traveled. How far north have you been? Figure out your latitude.